Pharyngitis can be acute, like many types of inflammation, and characterized by a rapid onset and typically a relatively short course, or chronic. 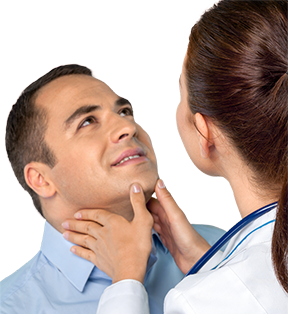 Pharyngitis can result in very large tonsils which cause trouble swallowing and breathing. Pharyngitis can be accompanied by a cough or fever, for example, if caused by a systemic infection. Pharyngitis is commonly caused by viral infections, bacterial infections, fungal infections, or irritants such as pollutants or chemical substances. Tonsillitis is inflammation of the tonsils most commonly caused by a viral or bacterial infection. Symptoms of tonsillitis include sore throat and fever. While no treatment has been found to shorten the duration of viral tonsillitis, bacterial causes such as streptococcal pharyngitis are treatable with antibiotics. It usually takes one to three weeks to recover. Laryngopharyngeal reflux (LPR), also extraesophageal reflux disease (EERD) refers to retrograde flow of gastric contents to the upper aero-digestive tract, which causes a variety of symptoms, such as cough, hoarseness, and asthma, among others. Although heartburn is a primary symptom among people with gastroesophageal reflux disease (GERD), heartburn is present in fewer than 50% of the patients with LPR. Other terms used to describe this condition include atypical reflux, and supraesophageal(or supra-esophageal) reflux.